I decided to ride the Chief Ladiga Trail from Start to Finish and back since the trail was complete. It was a nice ride, but a lot of constant pedaling. Very scenic, mountains everywhere. 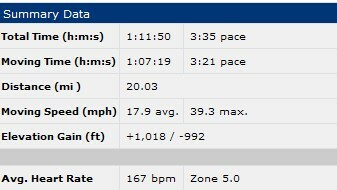 I was able to complete the first 36 miles start to finish without stopping. I took my time riding back and stopped about 6 times, sometimes to take pictures or enjoy the view. Maybe soon I will try to tackle riding all the way to Atlanta from Piedmont viae the Chief Ladiga and Silver Comet Trails. The people that live along these trails really have something to be proud of. I wish we had something like this around here. The trail was very safe and there were not too many streets that I had to cross over. Details from the ride can be found here: MotionBased. Pictures from the ride can be found by clicking here. Cleburne County, Alabama is putting the final touches on the missing four miles of the Chief Ladiga Trail creating a seamless ride from the US 27 Bypass east of Cedartown to Anniston Alabama. This is a 49 mile ride or a 46 mile ride if you start at the Cedartown Depot. Check our website before venturing out to make certain the paving has been completed. At press time, it was almost done. The Chief Ladiga Trail conveniently visits the downtown commercial districts of Piedmont, Jacksonville and Weaver on its way north of Anniston. The town of Weaver, only a mile or two from the temporary end of the trail, is a great place to have lunch and linger before making the return trip to Georgia. The “Trailside CafÃ©” has a decent menu and a friendly staff. You will cross the state line at mile 61.5 of the Silver Comet. PATH has recently completed the State Line Gateway project (see photo) with the help of Coca- Cola Co. and the Rails-to-Trails Conservancy. The Gateway will likely become a favored rest stop now that the Chief Ladiga is connected to Piedmont. You can park free at the Cedartown Depot for the trip to Alabama. 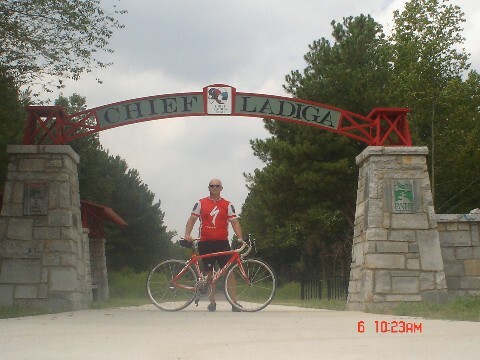 The Chief Ladiga travels through some extraordinary scenery and quaint country towns. (It is eight feet wide but much less traveled than the Comet, so the width is not a problem.) Much of the ride is in a remote area with few amenities between the towns themselves. Chief Ladiga Trail Update, Complete from Anniston to Atlanta!!! FYI, the Chief Ladiga Trail is now completely paved. It is 32.7 miles to the state line, and a total of 95.0 miles to mile 0.0 on the Silver Comet at Mavell Road. That includes roads for the missing gap between US27 and Grady Road on the east side of Cedartown.